Want to play? Want to host musicians? Volunteers: Sign up now and we’ll get in touch to let you know about opportunities to get involved. Make Music Markham is a citywide, street level music making celebration. There is a role for everyone and every organization in this DIY celebration – musicians, social media makers, businesses, restaurants, bars, neighborhood organizations, and non-profits. If you have an idea about how to add to the Make Music Markham merriment, and you have the time and skills to make your vision happen, we want to hear from you. Email us and we’ll hook you into the planning team. Interested in performing during Make Music Markham? Musicians of all abilities and genres are invited to showcase their talent and share their love of music! The event is an all-ages, all-inclusive celebration of music. 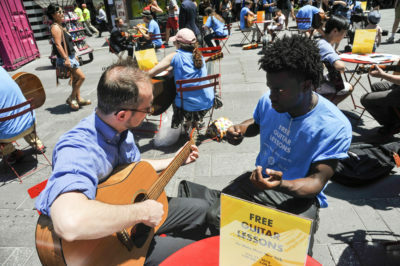 Everyone, regardless of age, ability, or preferred musical style can participate. We encourage you to embrace your inner musician, share music freely with your peers, and celebrate the rich musical diversity of your communities. Are you interested in hosting an event? Make Music Markham is a unique way to activate your space, engage your community, and inspire anyone and everyone to discover the joy of making music. Venues can be in front of or in stores and restaurants, front porches, parks, schools, and more. Venues may be located indoors or outdoors (preferably outdoors) and must be accessible to the general public without an entry fee. We’ll provide you with Make Music Markham decals so that everyone in your community will know you support Make Music Markham. Musicians and venues participating in the surrounding areas must obtain their own permits with their town/city or the property owner. 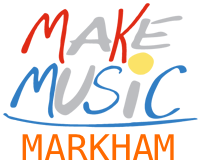 Only matches made through the matchmaking software will receive permits to participate in Make Music Markham. Make your match before June 1st to assure yourself a permit. All matches made through the matchmaking software will appear on the Make Music Markham map in early June. All content © 2019 Make Music Markham, unless noted otherwise. Make Music Markham is part of the Make Music Alliance.